It's funny, I don't remember my Gramma Paton baking a lot, but the things she did make were always very yummy. Last Christmas, I shared her Peanut Butter Chocolate Cookie Recipe and now I'm sharing her Apple Crisp recipe. I make this recipe every fall. 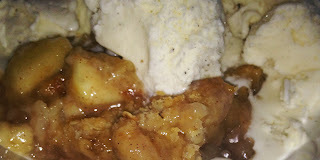 Put this apple mixture into the baking dish (8x8 pan). Pour 1/2 cup of water over the apple mixture. Mix the ingredients in bowl #2. You are supposed to use a fork so it has a loose, crumbly texture, but I've been known to use a spoon and it still tastes yummy. Sprinkle this over the apple mixture in the pan. If you want twice as much, just double all the ingredients and stick in a 9x13 pan! Oh this sounds like a wonderful breakfast! I know I'll be making this. And I better check out the peanut butter chocolate cookie recipe -- I don't remember seeing that last year!